“Editor”’s note: This is the first update from new contributor, Jordy. That’s right. We’re like a collective. I thank God, Allah, or whoever you might worship that Thanksgiving Day is done and over with. Don't get me wrong, it's not that I don't dislike the perfectly fabricated tale about the first colonists and the Native Americans. And I am thankful for what's come and gone from my life over the years. What I really don't like about Thanksgiving, what really get under my skin, is the inevitable conversation I share with all of my acquaintances. Person A: "So you're a vegetarian right?"? Person A: "So uh"? (awkward pause, slight chuckle) what did you eat?"? OK, so I might have fabricated the last part of that theoretical conversation; but the fact of the matter is, just because I don't eat meat, doesn't mean I don't enjoy food, eating or the holidays in general. Not all, if any, vegetarians are calorie, fat, and cholesterol hating monsters. I love Thanksgiving dinner. I eat mashed potatoes, stuffing (outside the turkey), cranberries and pie smothered in gravy (vegetable stock), just like everyone else. Mine and my family's holiday was not ruined or any less because of my lack of meat consumption. So stop smugly asking me what I ate Person A, and any other theoretical conservationist that might come my way. I will proudly step off my soap box now. Lightly steam the vegetables until part cooked. Combine the cider, sugar, margarine, nutmeg and spices in a non-stick saucepan and bring to the boil, stirring frequently. 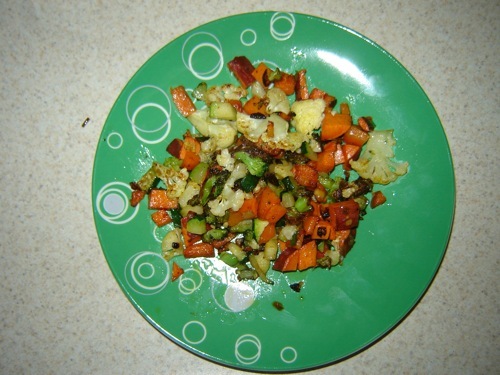 Add steamed vegetables and simmer for 5 minutes or until vegetables are tender. Do you recommend Vegetarian Cider Glazed Vegetables? Make your voice heard!